Yardley: Westholme, 2009. 193pp. $34.95. ISBN 9781594160769. Those involved in the study and re-creation of late medieval to early modern personal combat are all too aware of the dangers inherent in trying to bring to life a practice that has been lost for centuries. To venture earlier than the turn of the fourteenth century, from when our oldest fight manual dates, is to enter uncharted territory: rarely travelled and often dismissed as being of little use due to lack of sources. It is for this reason that I applaud the bravery of any attempt to shed some light on the combat of these earlier periods. Dr. William Short, in his Viking Weapons and Combat Techniques, has done just that. 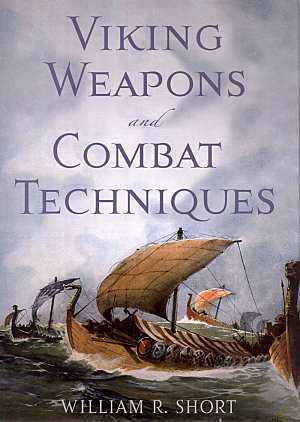 Rather than being deterred by the absence of material that would be thought of as essential to examine the individual techniques of a now lost martial art, he has decided to draw upon what primary sources are available in order to extract what insights he can on the fighting styles of eighth to eleventh century Scandinavia. Credit must be given to him for taking the time to clarify that, although he recognizes that ‘Viking’ refers to an activity and not to a people, he uses the term to describe the Norse peoples simply because it is so widely used as such today. With that understanding, Dr. Short begins his work with a concise historical overview of the place of weapons in Viking society. This includes the roles weapons played in daily life, cultural traditions and social mores (and the enforcement thereof), legal proceedings, myth and ritual. Having set the scene, he then discusses the various sources employed in producing his interpretation of the weapons and their uses, including archaeological finds, references to weapons and combat from the Sagas, pictorial evidence, and forensic analysis of weapon-related trauma on skeletal remains. Further, lacking any texts on personal combat from this period, he turns to later examples of such texts, particularly from the fifteenth and sixteenth centuries. Dr. Short maintains that a certain degree of reverse engineering can be done with regards to combat techniques. He essentially argues that providing the weapons in question are similar, certain core principles as well as certain techniques can be expected to have been maintained down through the centuries—providing that they remained effective. He is however quick to point out the differences that must be taken into account when comparing the tools and techniques of late medieval and early modern combat with those dating to around and before the eleventh century. The next group of chapters discuss the weapons and protective equipment of the Viking warrior. Each chapter is devoted to a particular piece of weaponry or armour, treating such matters as measurements and features of existing specimens, methods of construction, representations in primary sources, as well as speculation as to their use or on certain properties that cannot be validated by the sources alone. These chapters are brimming over with images of period illustrations and photographs of both original objects and of reconstructions to give the reader an idea of what pieces may have looked like when new. There are also images of re-enactors wearing and using the objects to contextualize them further. Finally, a bizarre (yet admittedly pleasant) feature is the series of images of scenic Icelandic landscapes, each the alleged locale of a notable event in the Sagas. Dr. Short then moves on to the interpretive portion of the book. Earlier in the text, he makes a point of emphasizing that, even when drawing upon contemporary accounts and techniques from early combat manuals, his theories on Viking combat are speculative and must be regarded as such. That established, he draws heavily on the later manuals, particularly Hans Talhoffer’s 1467 fechtbuch and Joachim Meyer’s A Thorough Description of the Free Knightly and Noble Art of Combat (1570). Beginning with the principles and techniques laid out by Talhoffer and Meyer, Dr. Short adjusts them accordingly and speculates on their possible applications to earlier styles. He then outlines a series of step-by-step two-person sequences using the traditional Viking combination of sword and shield. These descriptions are illustrated by photographs depicting each step. The two remaining chapters, for sake of thematic grouping, would probably have been better off before the interpretive section, allowing all of the historical contextualizing to be together and leaving the interpretation for last. The penultimate chapter deals with other weapons used by Viking warriors that were not mentioned in the preceding chapters, such as the bow and various staff weapons. The book closes with a brief glance at the waning age of Viking raiders in the late eleventh century. As mentioned earlier, this must not have been an easy undertaking. This book clearly represents years of pouring through source material to distil a few useful insights, followed by exhaustive deliberation and experimentation before the theories presented here came together. For the most part, Short goes about his work here with admirable scholarly restraint. He not only acknowledges the ultimately speculative nature of this work, but even demonstrates a willingness to include the ideas and interpretations of others researching Viking combat side by side with his own so that as much data as possible can be made available in a single place. He also demonstrates a superior working knowledge of the Sagas, which he admits is the passion that led him to the study and re-creation of Viking society. There are, however, several areas where I advise caution. For both the scholar and the enthusiast that prefers to follow up on sources, the absence of citations and a full bibliography is disappointing. It is also a mildly perilous choice for Dr. Short to have made since, in apparent contradiction to his philosophy of putting all the information out there so that others might stand on his shoulders, readers do not have the opportunity to examine the sources which provided the evidence for his claims for themselves. The only exception to this is the various passages quoted from the Sagas, which are referenced meticulously. There is a list of ‘Selected References’ at the back, but these are merely his recommendations to the reader for further reading and he prefaces the section by saying, ‘I’ve tried to avoid listing materials that, in my opinion, fall short in scholarship or readability.’ But as to the source of his more specialized evidence pertaining to social history and to the arms and armour themselves, he is unfortunately silent. Structurally, some of the chapters should have been more tightly focused. Although there is a chapter designated as dealing with techniques, discussion of technique is found throughout the individual chapters dealing with arms and armour. Furthermore, the chapter on techniques drifts away from its intended purpose toward the end, its closing sections discussing training of children and sparring combat. The final paragraph is an anecdote on how, during a particular fight in which the combatants fell into some water, one fighter pulled down the trousers of the other, preventing his ability to swim and causing him to drown. Surely these points could have found a better home in one of the earlier chapters. A number of claims regarding weapons and armour are vaguely questionable. Whether it is allusions to helmets in excess of ten pounds, pommels attached to the tops of swords with pitch ‘or other means’, or extensive sword repairs resulting in the shortening of the tang which in turn resulted in a shorter grip, any issues with these assertions could be resolved if only he had cited his sources. In other cases, some of his assertions are based on personal experience with replicas, a potentially dangerous practice given the variable accuracy in the specifications of a great deal of replica weapons and armour available to re-enactors. While looking to the sagas as a source of evidence for Viking weapons and their uses is a sensible approach, the source must be understood for what it is: epic storytelling prone to exaggeration for the sake of producing an exciting tale. It seems that Dr. Short occasionally falls into the trap of taking some of the more outlandish exploits related in these tales literally, sometimes using them as illustrations as to the various ways in which a weapon could be used. A notable example, in the chapter discussing spears, is the reference to an instance where the hero slides down a snowy hillside on his spear. Surely this must be understood as being pure embellishment and not an accurate depiction of an innovative use of one’s spear as a ski or surfboard. If the author understands this fact, he did not make it apparent in the text. Dr. Short’s approach, while founded on reasonable principles, presents the reader with equal portions of useful and intriguing theories and debatable conclusions and inconsistent scholarship. Had he primarily focused on the interpretation of techniques, rather than trying to include detailed sections on Viking-era arms and armour, where he falls short, the book would have been more of an overall success. Unfortunately, I can only whole-heartedly praise his efforts in the former. There is very good reason for the general lack of works attempting to reconstruct combat predating the late Middle Ages. But his efforts should be regarded with admiration, if nothing else for putting something out into the public forum so as to stimulate debate. It is my hope that Dr. Short’s work will be a catalyst for deeper and more frequent inquiry into this neglected area of historical combat study.